Picking up from the inaugural edition in 2015, 2016 Topps WWE Undisputed Wrestling returns with another high-end look at World Wrestling Entertainment. Each hobby box promises ten total hits, including six autographs and two autograph relics. 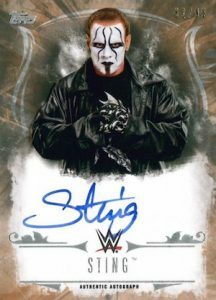 The 100-card base set showcases the greatest WWE Superstars and Legends on quality stock. Parallels include WWE Tag Team Championship Bronze (#/99), Divas Championship Silver (#/66), United States Championship Blue (#/25), Intercontinental Championship Gold (#/10), WWE World Heavyweight Championship Red (1/1) and Printing Plates (1/1). 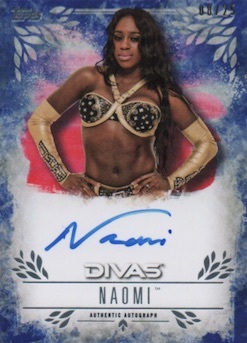 Among the many hits, Undisputed Autographs (#/299) showcase WWE Superstars, Divas, Legends and NXT wrestlers with on-card signatures. There are also quite a few parallels to track down with Bronze (#/99), Silver (#/66), Blue (#/25), Gold (#/10), Red (1/1) and Printing Plates (1/1). Other signed inserts include Faction Triple Autograph Books (#/10), Family Ties Dual Autographs (#/25) and one-of-one Tribute Cut Signatures. Autographed Superstar Sketches feature one-of-one wrestler-drawn sketches that are signed on the back. 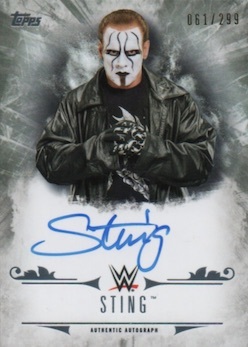 Averaging two per box, autographed relics are another major component of 2016 Topps WWE Undisputed Wrestling. Undisputed Autographed Relics add an authentic swatch to the signature and feature Bronze (#/99), Silver (#/66), Blue (#/25), Gold (#/10), Red (1/1) and Printing Plates (1/1) parallels. Autographed Divas Kiss & Clothing Relic Books (#/5) are another option. Undisputed Relics also cover many key wrestlers with worn relic swatches that are each numbered to 175. Finally, basic inserts close out 2016 Topps WWE Undisputed Wrestling. Divas Revolution (30 cards - 1:5 packs), NXT Prospects (30 cards - 1:3 packs), and Undisputed Tag Teams (40 cards - 1:4 packs) offer larger sets to track down. These feature the same parallels as the base cards. 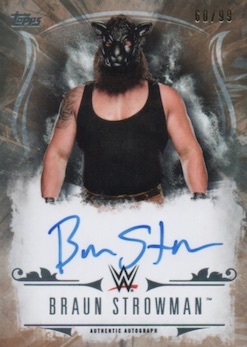 Collectors can also find 2016 Topps WWE Undisputed Wrestling metal wall art for the base and insert designs through the Topps Online Store. PARALLEL CARDS: WWE Tag Team Championship Bronze #/99, Divas Championship Silver #/66, United States Championship Blue #/25, Intercontinental Championship Gold #/10, WWE World Heavyweight Championship Red 1/1, Printing Plates 1/1. PARALLEL CARDS: Bronze #/99, Silver #/50, Blue #/25, Gold #/10, Red 1/1, Printing Plates 1/1. 1 artist. Serial Numbered 1/1. PARALLEL CARDS: Bronze #/99, Silver #/66, Blue #/25, Gold #/10, Red 1/1, Printing Plates 1/1. 37 cards. Serial Numbered #/175. Good: Plenty of hard-signed content, great primary design, all autographs and relics are numbered. Bad: Autograph checklist does not quite match the price point, main relics are weak in both quality and design, hits switched from 10 autographs in 2015 to 8 in 2016. The Bottom Line: When Undisputed first emerged last year, it was unique as a hit-focused WWE set with special attention paid to card quality and on-card autographs along with a strong checklist. While 2016 Topps WWE Undisputed Wrestling follows suit, the newness is largely gone and the brand has not really done anything to grow or improve. This is further realized by list of signers that don’t quite match the 2015 edition, and a dip in autographs per box. Admittedly, there is not all that much of a difference between the two years as far as design, especially for the base cards, but I feel the vertical layout for the main autographs is more appealing. The stock is top notch and the cards are both simple and modern while still feeling like a premium set. Given the choice, I would probably not go with the filled-in border/frame but it does give the base and inserts a more distinct look. It is once again disappointing that the autographed relics feature a sticker signature. I’m not the first to say it, but sticker autographs don’t belong in products at this price especially when there are on-card autographs from the same wrestlers in this very set. Perhaps the biggest issue for me in terms of design is the relics. Overlooking the fact that these two relics essentially replaced autographs from 2015, very little effort was made to make them stand out. The design is almost literally the same as the autographed relic, but without the sticker. This was so much the case that when I first saw them, I assumed the autograph had been left off by mistake. On top of that, they are small and most feature plain swatches. 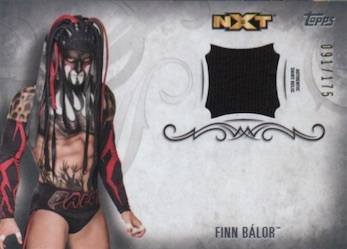 While the design is one of the clear strong points, the checklist is where 2016 Topps WWE Undisputed Wrestling struggles more. Sure, there are some good names to pull. But, the checklist skews heavily to up-and-comers, leading to some weak spots. Although the various inserts did enough to keep the variety solid, from a checklist standpoint, separating them out seems unnecessary. In my mind, it makes more sense to just have a true 200-card base set with SP subsets. 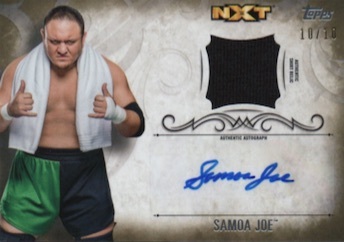 Another area of concern for 2016 Topps WWE Undisputed Wrestling, losing two autographs for base relics hurts the value. At around $190-200 for eight autographs, the potential is there but when you consider the standard print run of 299 and all the parallels, the autographs are not quite as rare as one might think. Still, with that many numbered autographs, and six being on-card, the risk is not as huge as other high-end releases when you break it down. I can always appreciate quality cards and 2016 Topps WWE Undisputed Wrestling certainly has that covered. Where the fun lessens for me is the move to include relics that simply don’t belong here. Minimal design effort aside, the fact that these two replaced autographs is even more of an issue. Another problem I ran into was autograph collation. I’m not sure if I just had bad luck, but when there are eight autographs but only six different signers, that can take the fun away. Granted, the two duplicate autographs were parallels, but the point remains. Very disappointing autos this year and still no Paige. While there are some dud names on the checklist, I’ve seen very few bad boxes. Most have at least one big hit. I busted one box and that one big hit was a Sasha Banks on-card auto numbered to 10 that covered the whole cost of the box. I don’t know how much the reviewer knows about the WWE, but the fact that this set focuses on newcomers is a plus at the moment. Boredom eventually sets in even with the biggest superstars. There are a ton of John Cena autograph cards out there, but there aren’t as many WWE autographs of Finn Balor, Sasha Banks, Bayley, Samoa Joe, Becky Lynch, etc. These autos are in bigger demand than most of the established stars. The checklist is certainly better than what you see in every high end Panini product and most other Topps high end checklists. You trash the jersey cards, but the lower numbered ones have some great swatches from the prints on the official jerseys. On the Blowoit Forums, I saw a great break where someone pulled a John Cena jersey card where the swatch was Cena’s face from his jersey. The New Day relic cards have some great swatches as well. This is a great, fun product for wrestling fans and the singles were selling very well when the product was initially released. I’m not sure who else you want in there from the current roster. If you had paid for this box and were smart with your listings, you should be able to get your money back on this box of that’s what you are interested in. 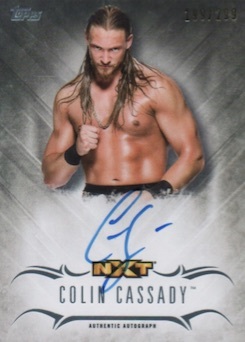 If not, you got a great autographed 1/1 of someone just called up to the main roster, a Big Cass auto when he’s one of the most popular members of the roster, and the Icon Sting. Sure, the Joe numbered to 10 is a sticker auto, but that’s still a great card. Sure, no single card will cover the whole box like the box I opened, but this is not a bad box. Mike Travers � I’m glad you liked the product. I thought it was okay. I am entitled to my opinion just as much as you are. I never said it was a bad box. I merely pointed out what I saw as the good and bad in the product as a whole. I just pulled a WWE Legends Auto of Edge card #UA-E out of /199.. You can add this one to the list.